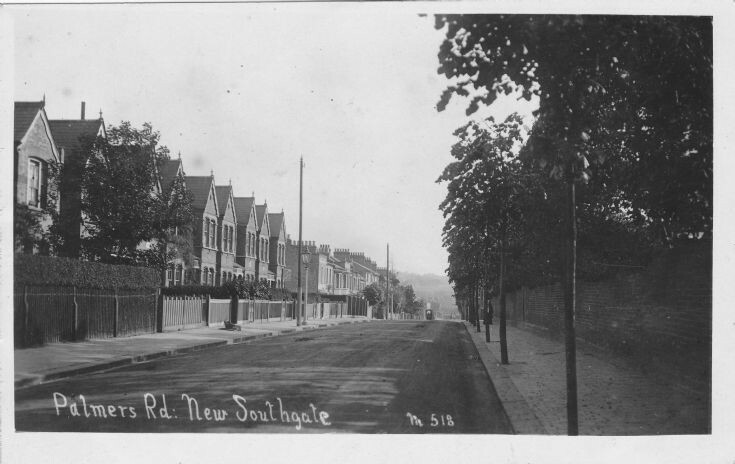 Palmers Rd., probably 1920's, looking North. Originally called Palmers Green Rd., ran between the High Rd and Bowes Rd., coming out nearly opposite Arnos Grove Stn. I suggest this is actually looking west and downhill towards the bottom half of the High Road. Palmers Rd is on a slight slope up to Arnos Grove Station. The hill in the background would be the ridge into which the railway tunnel was built and near the Bottle Company site and further on was the edge of the golf course? I agree with you, Peter. The photographer is standing by Arnos Court. I used to live at 86 Palmers Road, approximately where the vehicle is. Thanks Gerry. I was trying to remember the name of that court. We have a member of the Garfield Reunion group who lived near you at the top of Palmers Road, Colin Marr, who started our books of memories and I hope he can contribute more next year if we publish some photos of the area. Colin was born about 1940 and went on to Trinity school, and lives in Muswell Hill. Looking at where the vehicle is, you must have been nearer Springfield Road junction and not far from where Dave Cole and Mike King lived. They are also members of our Garfield New Southgate Group. Thanks again.